成人の日せいじんのひ・Coming of Age Day is the second 公休日こうきゅうび・public holiday on the Japanese yearly カレンダーcalendar. It was established as a national holiday in 1948 but has roots dating as far back as 714, when the 皇太子こうたいし・Prince of Japan had his hair cut and a new set of clothes made to mark his transition into 成人せいじん・adulthood. Today, 成人式せいじんしき・Coming of Age Ceremonies are held at city, town and local 市役所しやくしょ・government offices throughout the country to celebrate, encourage and 祝ういわう・congratulate people who have reached the age of 20 (Japan’s age of majority) or those who will reach the age of majority by April 1st of that year. The ceremonies are also intended to help them realize and reflect upon the expanded rights and greater responsibilities that come with 成人せいじん・adulthood. The ceremony is traditionally an opportunity for women to wear beautiful and elegant 着物きもの・kimonos） (a style of kimono that have baggy sleeves with strips of fabric that hang down past the waist), and visit a 美容院びよういん・beauty salon to be dressed and have their 髪かみ・hair styled for the occasion. Men may also wear dark colored kimonos and 袴はかま・hakama (a traditional men’s outfit for formal occasions) although the western suit and tie has become more common than the traditional hakama. 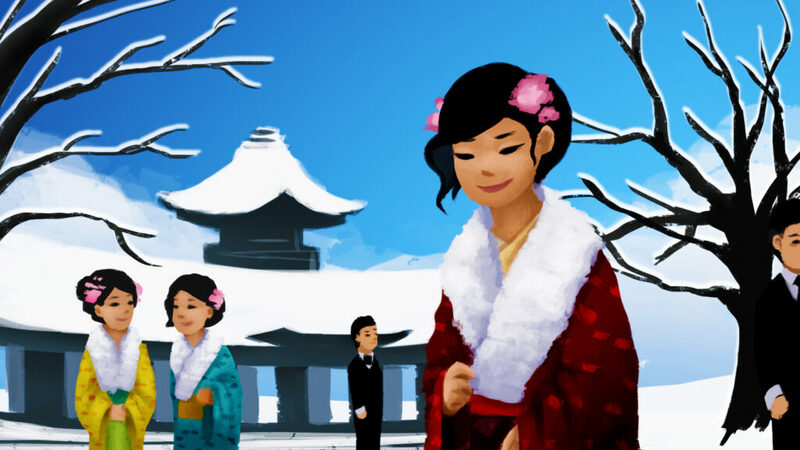 After the ceremony many young adults 祝ういわう・celebrate by holding or attending parties and going out to drink.